Oakleaf is premium admin dashboard powered with SASS. It’s builded on popular Twitter Bootstrap v3 framework. Oakleaf is fully based on HTML5 + CSS3 standards. Is fully responsive and clean on every device and every browser. Oakleaf contains many example pages with many ready to use elements and is strongly customizable. 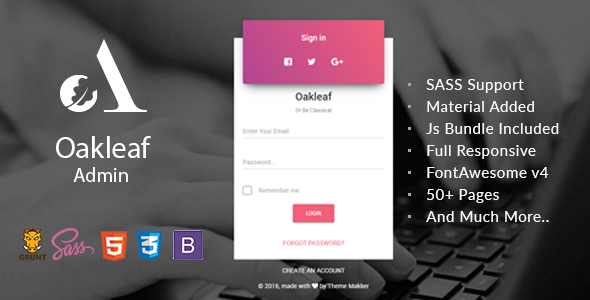 Oakleaf work on every modern browser, any device and any screen size. Oakleaf Admin includes many plugins implemented in 50+ separate HTML files. It is designed to be a complete admin panel for any web project.